Kelty Apperson of Wilcox, Saskatchewan will be suiting up for the Green and Gold this fall when they hit the ice at the new Grant*Harvey Center. A skilled forward Kelty was third on her team this year with 36 points and will be leaned on to help charge the Tommies offense. 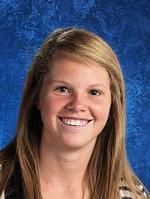 From GoTommies.com, "Kelty Apperson feels St. Thomas will be a great fit for her. The five-foot-eight Saskatchewan native played for the Notre Dame Hounds where she was an Assistant Captain and contributed to back-to-back provincial championships and the 2011 National Midget Championship, the Esso Cup. She was named to the Saskatchewan Female AAA all-star team during her time there. She’s also excelled in soccer and lacrosse." “Kelty comes from a winning program and shows great speed to accompany her size,” said Coach Peter Murphy. “She has a quick release and will force teams to respect her as a threat. Her great character and personality were evident on her tour and we look forward to great things from her both this year and as we move forward to Nationals in 2014."